I loved this book! As someone who has lost track of the number of times I’ve been hoodwinked into reading so-called sci-fi comedy mashups à la Douglas Adams or Star Trek-like spoofs only to have them turn out to be cringeworthy juvenile attempts at humor, all I have to say is Gate Crashers is the real deal. Smart, funny, and creative, it elicited more than a few genuine belly laughs from me, and not a lot of books can do that. Our story begins with humanity’s first extra-solar mission aboard the space exploration starship Magellan, the most advanced vessel of her kind. Carrying a crew in suspended animation, the ship AI, affectionately nicknamed Maggie, notices an anomaly on her sensors and wakes Captain Ridgeway from her stasis to inform her of the discovery. The anomaly turns out to be of alien origin, and Ridgeway, deeming this evidence of intelligent extraterrestrial life too important to ignore, decides to load the artifact on board and report the find to Earth. Meanwhile, back at home, researchers, politicians, and the media are working themselves into a froth trying to understand and reconstruct the alien technology. Eventually, the mysteries of the alien artifact are unlocked, changing the trajectory of human space travel and exploration forever. Within a relatively short time, a powerful warship, designed and built with a shiny new hyperspace drive, joins the Magellan in deep space, captained by the chauvinistic, cocky, and supremely vain Maximus Tiberius (with the inspiration for his character being immediately obvious). But humankind’s sudden leap forward in technology and knowledge has not gone unnoticed. It appears that Earth has upset the original creators of the alien artifact, who have been tracking Maggie’s movements ever since their property was stolen. The even greater threat, however, is a more aggressive alien species called the Turemok, who sees humanity’s first awkward baby steps at faster-than-light travel as an opportunity to frame Earth and start a galaxy-wide war. Gate Crashers fully delivers on the promise of an entertaining and adventurous romp through space. My past experiences with books that have touted something similar, such as Steven Erikson’s Willful Child, Joe Zieja’s Mechanical Failure, or Catherynne M. Valente’s Space Opera, have mostly been enjoyable, but in my eyes, they all lacked something important: balance. Humor, especially parody, can be quite tricky. What I’ve learned is that the amount of silliness in a story is usually inversely proportional to the amount of depth you’ll find. Go overboard with the slapstick or toilet humor, and you also run the risk of turning off your readers looking for something less infantile. Then, there’s personal taste. What one person laughs at might make someone else groan. Some readers prefer in-your-face jokes and gags, while others go for dry and subtle wit. Myself, I tend to gravitate towards the latter, with just a sprinkle of the former. But above all, I just want a worthwhile story. Gate Crashers is proof that a sci-fi comedy novel can be full of warmth, depth, and substance without sacrificing any of it for the humor. Here we have a full-flavored plot, despite many of the book’s elements being homages to popular science fiction motifs. Readers will be able to spot nods to everything from Star Trek to The Hitchhiker’s Guide to the Galaxy, though the story of Gate Crashers also has enough originality to stand on its own. I also loved the characters, even when it is clear some of them are light parodies of the genre. In humor, a lot of first contact stories depict humans as doltish and incompetent idiots who wind up embarrassing themselves on the galactic stage like some drunken uncle at a dinner party. With only a couple exceptions, Tomlinson’s portrayal of Ridgeway and her fellow space explorers aren’t anywhere near so extreme. There’s a difference between stupidity and ignorance; the humans in Gate Crashers might not know what they’re doing, but they have enough common sense to use what knowledge they have to do right by themselves and the aliens. While their bumbling attempts at space diplomacy might look foolish and absurd, the characters are genuinely full of heart and well-intentioned, qualities that make them very likeable. Everyone has a story (even the non-humans), demonstrating the author’s efforts in character development. Most of them are dealing with very relatable problems or internal conflicts. Even James Kirk—I mean, Maximus Tiberius is someone you will want to root for, as much as he makes you want to shake your head. Perhaps what works most about Gate Crashers is that it could probably be categorized as full-on comedy, but general sci-fi readers can also enjoy it as an adventurous space opera with comedic elements. While books of this genre aren’t all that uncommon, I found the blend of humor and amount of substance behind the story to be just right, and for me to find something that strikes that perfect balance is very special and rare indeed. 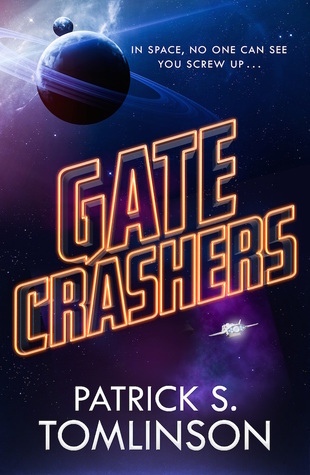 If you’re looking for a genuinely entertaining and clever sci-fi novel that will also leave you with a big smile on your face, Gate Crashers is your answer. Highly recommended. I’m usually weary of funny books, as some of them tends to be just plain silly. I love star trek and hitchhiker’s guide, so mentioning those two things as similarity is certainly a good sign! Smart, funny and creative – tbh you had me at ‘belly laughs’. Added. Yay! Hope you’ll enjoy it! Already laughing at Maximum Tiberius lol. Sounds fun, adding to my list! I’ve had this on my radar and some time and as a sci-fi newbie, was just waiting on some reviews. Your review has solidified this for me and it’s going on the TBR! Great review. I really enjoyed this too, maybe not quite as much as you, but I agree, his balance of humor and action was well done. It’s maybe a bit too sci-fi for me but it’s great that you had a great time with it! Yep, I’ve been let down so many times by blurbs that promise genuine wit, but instead I get stupidity and toilet humor. I’m a lot more careful picking my sci-fi humor now! Omg really? I would love something like this! Yes! And I think this is available in audio too! Need to get to this one! Great review as always! Hmmm, this does sound fun! It’s been a while since a book has made me really laugh! What a wonderful review. I’m thrilled you enjoyed the book as much as you did. I’m diving into a rewrite of the next book in the universe now. STARSHIP REPO comes out next June. And yes, it’s exactly what it sounds like. Sounds like you had a really good time with this one!